Value Funds are funds that follow a value investing strategy. A Value Fund is a separate category defined by SEBI recently. These types of fund Invest in stocks which are undervalued. The basic idea behind investing in undervalued stocks is these stocks are expected to generate higher returns in the future. Investing in undervalued stock or value fund is like following a golden rule of the stock market “Buy Low Sell High”. The steps followed for value investing are given below. In short, value fund employs the fundamental analysis approach for research and investment. These type of fund are suitable for moderate risk long term investors. Value Funds offers multiple benefits to the investor. Few benefits of value fund are given below. Value investing is proven and one of the most successful equity investment strategies. This investment strategy works in almost every market condition. Value Funds are for moderate risk taker investor. It offers a cushion and stability to your portfolio. Fund manager of these funds buy stocks at a low price and sell them later at a higher price. This means Investors are likely to get a better return by investing in value fund. By investing in value fund, you can get exposure to value picks in various market capitalisations which provides you benefit of the diversification. As far as value fund investing is concern it is fairly beneficial. However, there are few risk elements associated with value funds. You should consider the following risks while investing in value funds. Managing a value fund is not child’s play. Fund manager plays important role in value fund. Selection of the wrong fund house and fund manager turns out to be a risky affair. Value Funds are prone to “value trap”. This means some of the undervalued stocks present in value fund may not appreciate from the current value. Value investing involves the risk that the market will not recognize a security’s intrinsic value for a long time. It means value fund require a lot of time and patience. How to Identify Best Value Funds for Investment? The method which I have followed to identify best value funds for investment is given below. Investment Style – Mutual fund that follows a value investing concept and classified as a value fund. Fund performance history – The comparison is done for 5 years. Some funds have underperformed for last one year but performed well in the last 5 to 10 years. Fund Rating – Another important factor is the fund rating. Value fund that have good CRISIL and value research rating are shortlisted. Fund Manager – Fund Manager Skills and experience is another important factor that is taken into account while selecting funds. Diversification – Investment of fund in various market capitalization and diversification risk minimization is another factor considered while identifying best value funds for investment. Invesco India Contra Fund is a popular value fund. Invesco India Contra fund is for the moderately high-risk investor. This fund is rated with a five-star rating by valueresearchonline. This fund offers the benefit of various capitalization as it invests in large, mid cap and small cap stocks. It is managed by an experienced fund manager. This fund has a very good performance history. This fund has given a return of 13.64% since launch (As on Oct 2018). 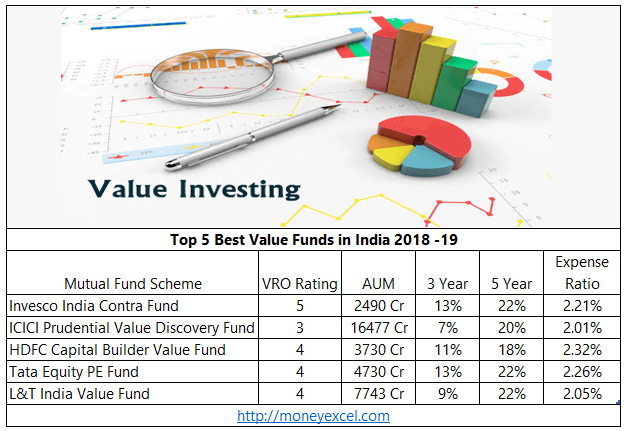 ICICI Prudential Value Discovery Fund is next in the list of Top 5 Best Value Funds. In the last few years, it was observed that this fund is not performing well, fund rating of this fund was also downgraded. However, now it seems that this fund has started performing well. In the last five years this fund has given 20.32% return to the investors. HDFC Capital Builder Value fund that primarily invests in undervalued stocks. This fund is rated with four-star rating by valueresearchonline. This fund is managed by experienced fund managers. This fund has given 17.88% return to investors in last 5 years. Tata Equity PE Fund invests at least 70% of its assets in companies with lower P/E than BSE Sensex. The remaining 30% of its assets are invested in well-researched stocks. This fund has given a return of 19% since launch. However, this fund could not perform well last year. This fund offers very good diversification benefit to the investors. L&T India Value Fund is next in the list of best value funds. This fund offers the best of both worlds. This fund invests in the undervalued stock of Indian as well as international market. It is a highly rated fund. Unfortunately, this fund has not performed well in last one year. However, over the long run, this fund has given a very good return to the investors. Do you invest in Value Funds? Do you think value funds will give better returns in the future? Do share your experience, comment, and query in the comment section given below. « Should you Invest in Credit Risk Fund?